It takes some planning to get your projector screen set up to get the perfect location. You’ll first have to consider the location of the projector. 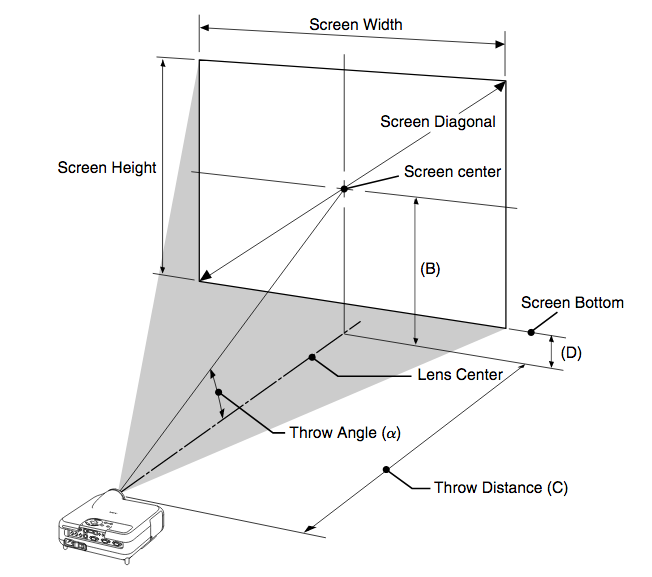 Most projectors are designed to have the middle of the lens project just a bit above the bottom edge of the screen. You’ll want the ideal set up for your projector screen. The standard set up for the ideal height for a squared off image is to have the projector rest on a small table in front of the screen. 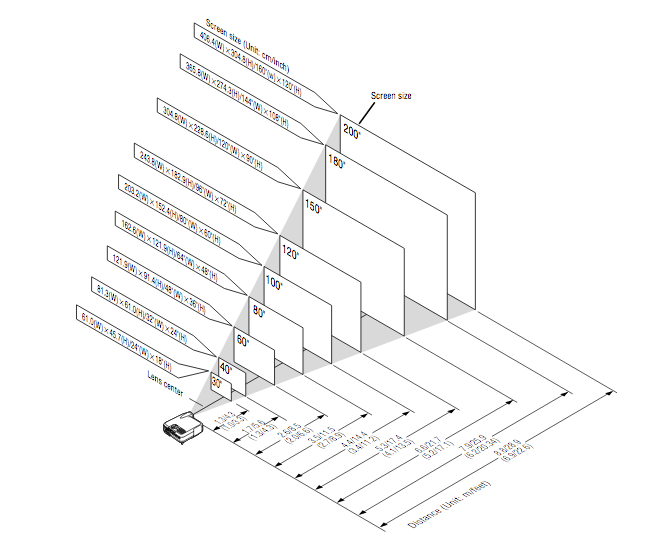 Projectors with a vertical lens shift will have more flexibility and range. Since you won’t be able to sit in the path of the light beam, you may consider mounting the projector on the ceiling for more space. The next step is finding the perfect location for your screen. The bigger that projection, the better the picture but you will need to put the screen further away. The minimum size the image can be is approximately 30″ (0.8 m) measured diagonally when the projector is roughly 4 feet (1.3 m) from the wall or screen. The largest the image can be is 500″ (12.7 m) when the projector is about 80.83 feet (24.64 m) from the wall or screen. Consult the drawing below as a guide. Need help calculating the right size projector screen for your needs? Check out this online calculator. Each screen has an aspect ratio. The most common options are typically 16:9 or 4:3. Make sure your screen’s aspect ratio matches your projector’s for the best possible viewing experience. 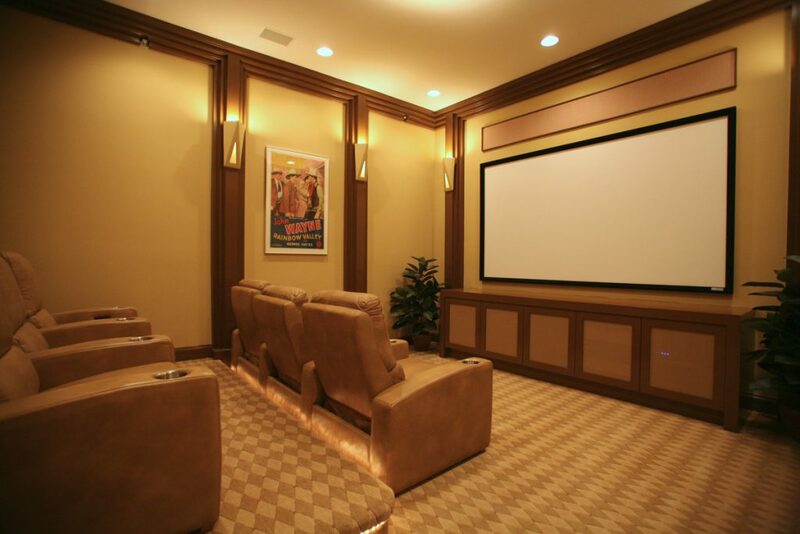 The ideal screen size takes into consideration both the width and depth of the viewing room. The biggest consideration for setting up your projector is the throw distance, which is the proportion of width and height of an image projected onto the screen. It’s typically expressed as numbers, such as 4:3, but these numbers ARE NEVER the size of the screen. You will need to calculate the distance of the projector and then adjust it with the projector turned on.